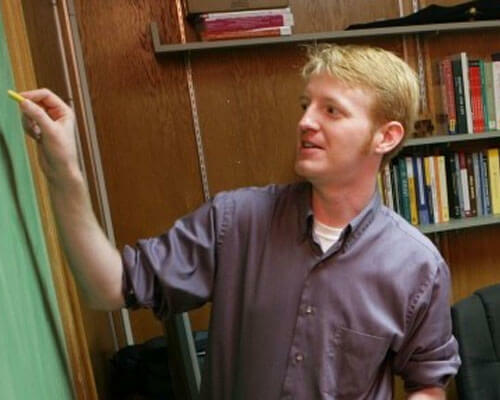 Home » Academics » Schools » School of Science, Engineering and Technology » Faculty » Ryan Dunning, Ph.D.
Ryan Dunning, Ph.D., joined the St. Mary’s University Department of Mathematics faculty in 2009. He received his bachelor of science in mathematics from Texas Christian University in 2004, and his master of arts and doctorate in mathematics from Rice University in 2007 and 2009, respectively. His primary research interest is knot energy, with a current focus on the energy of knots in lattices. His teaching interests include inquiry-based learning. Dunning serves as the faculty sponsor of the St. Mary’s Society of Mathematicians and as a Marianist Educational Associate. He is a member of the Mathematical Association of America. Dunning, R. Optimally Immersed Planar Curves Under Möbius Energy. Journal of Knot Theory and its Ramifications. Volume 20. Issue 10. October 2011.